An experiment of sorts: today I published a very detailed report for Enders Analysis on the iPhone’s market share in the USA. Enders is a subscription business, so I can’t post it all here, but I’ll be sharing some of the more compelling charts over the next few days. Today: smartphone market share. 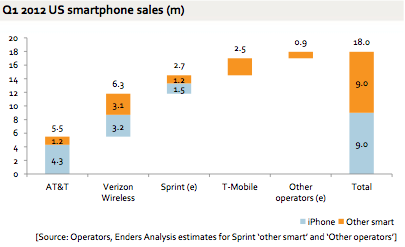 Since the US operators disclose their iPhone unit sales and their smartphone bases, and AT&T, Verizon Wireless and T-Mobile disclose total smartphone sales as well, you can make some pretty good estimates as to where the market is going - far better than relying on panel data, as some of the more widely-quoted stats do. 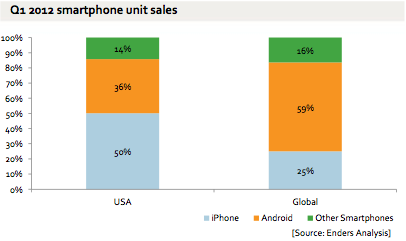 Android is outselling iPhone by more than 2:1 on a global basis. But in the USA, Apple is massively outselling Android. That has obvious implications for where (mainly US-based) developers should be placing their efforts. Tomorrow, the install base, and what effect expanded distribution has had.